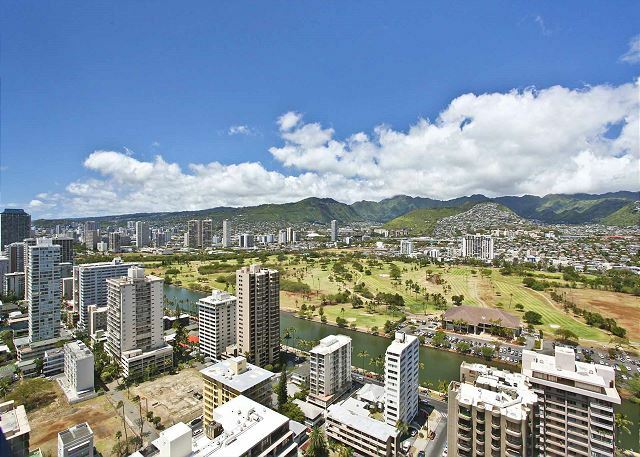 Waikiki Banyan #3605-T2 - Views of mountains & Ala Wai Canal - Waikiki city lights sparkle at night! POOL CLOSURE NOTICE: Pool and Jacuzzis will be temporarily closed from May 13-19, 2019 for annual maintenance work. Pool is scheduled to reopen on Monday, May 20th (May 27th for Jacuzzis). Compensation at 20% of room rate will be provided after closure begins. 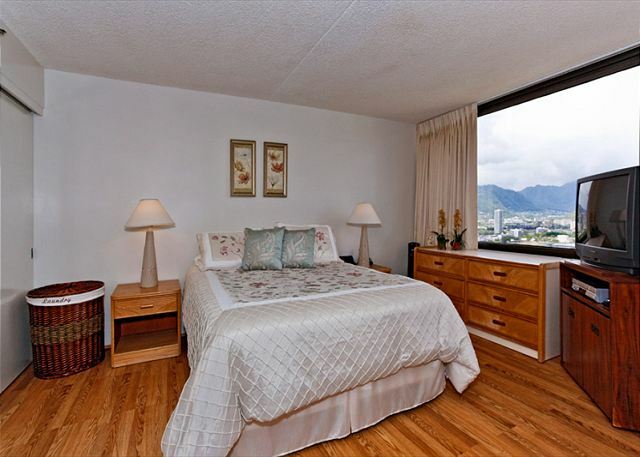 Enjoy sweeping views of the Ko’olau Mountains by day and city lights by night from this deluxe, 36th floor, air-conditioned one-bedroom suite (533 sq.ft. plus lanai with table and chairs). Coffee shop on premises. Coin operated laundry facilities are on located on each floor. Public transportation is readily available, extremely reliable, and located right outside the building on Kuhio Ave! This non-smoking accommodation sleeps 4. During our Holiday Season (12/20-1/4) there may be a 7-night minimum. Please check with our Reservation Department for details. The room was clean, and as described. Recommend Captain Cook Real Estate. Byron was great to work with, Thanks Byron. Aloha and Mahalo for the wonderful review! We are pleased that your stay was enjoyable! Thank you very much for the positive comments. It’s always encouraging when customers acknowledge the good work of our team. We look forward to seeing you again soon. P.S. We think Byron is great to work with too! Mahalo for the 5-star review, Kim! So glad to hear you enjoyed your stay in this great condo! We look forward to your next visit! 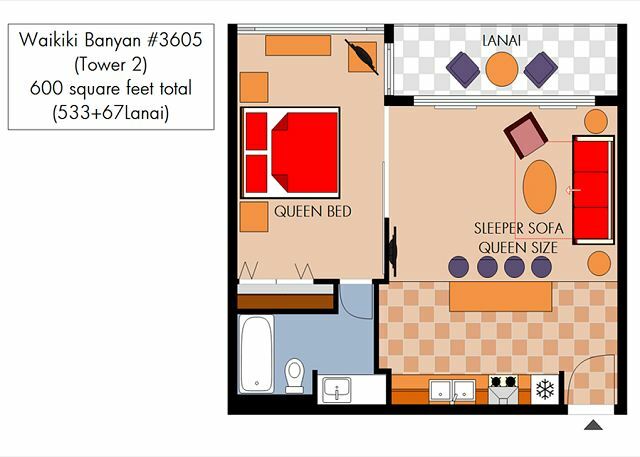 The apartment is very nice and comfortable and has well equipped kitchen. The location is excellent, close to the beach and Waikiki life. Very nice place to stay and enjoy Honolulu. Good experience overall. The master bed was comfortable, bathroom was decent size and the kitchen was well equiped. It was great having beach chairs and towels available too. The pull out bed could use reinforcement since it sags terribly in the middle. 1-2 kitchen cabinet doors need to be repaired and 3 out 4 sliding doors to the bedroom are missing rollers. the sliding door to the bathroom needs some attention too. Aloha and thank you for posting a review of your recent stay. We are delighted that your stay was enjoyable and you appreciated the mountain views and amenities of this great condo! We apologize for the problems you encountered with the maintenance issues. It sounds like we missed the mark on quality control. The property manager has repaired the kitchen cabinet doors, and sliding doors - thank you for bringing those items to our attention. I will pass your feedback on to the Team and look forward to your next visit. Mahalo for choosing to stay with Captain Cook Resorts and the great review and recommendation! We're so glad your visit was enjoyable and you appreciated our friendly check in and the amazing views of this wonderful condo. We look forward to seeing you again. Our stay in the rental was great. Everything in the rental was clean and useful. Everything was within walking distance. Having parking at the rental was definitely helpful. Getting in touch with property management was easy. Would definitely rent from them again! Mahalo, for the wonderful 5 star review and recommendation! We're delighted to have provided all of the needs you required for an enjoyable stay! We look forward to your next visit! Had a wonderful stay at the apartment. Very clean and comfortable. Captain Cook staff were amazing and extremely helpful. Would book with them again. Clean, quiet, confortable, good location, excellent for a family of 4, formidable view. I will come back on my next trip to Waikiki. Mahalo for the 5-star review! So glad to hear you and your family enjoyed your stay in this great condo! We look forward to your next visit! Unfortunately, our system doesn't translate Japanese yet, but we can see by your rating and recommendation, you enjoyed your stay! 2nd time here and happy! We stayed here July 2017 and came right back to the same until the very next year because we were so happy with it. :) the staff at Captain Cook is great and we were very happy with the condo! Byron checked us in both years and he’s fantastic! Mahalo and we will see you again! The room was clean and as shown in the pictures. Beautiful view and everything in the kitchen worked. The city lights at night look like a floating city. My only complaints are that the elevators take forever, and the unit above was dripping water down on the balcony (maybe from the air conditioner?). We did have a problem with the door combination but the management responded and the issue was easily resolved. I think this is a good value for a family with kids who are planning on walking to the zoo and beach. Mahalo, Julie, for taking the time to share your recent experience! It's always great to get this kind of feedback - we're so glad you enjoyed your stay! We will pass your feedback on to our team and look forward to seeing you on your next visit! Mahalo for your great review! We look forward to your next visit! Die Wohnung ist sehr schön. Der Blick aus dem 36. Stock Richtung Golfplatz toll. Wir waren mit zwei Kleinkindern dort. Die Schlafcouch ist sehr bequem. Der Raum kann mit einer Schiebetür abgetrennt werden. Die Küchenausstattung ist sehr gut und alles war sehr sauber. Der Verwalter ist sehr nett, es hat alles super geklappt. Wir würden jederzeit wieder buchen! Mahalo, for the lovely review and for choosing to stay with Captain Cook Resorts during your recent visit to Hawaii. We're so glad you and your family enjoyed your stay and pleased that you found everything comfortable! We look forward to your next visit! This was a clean condo with everything we needed, only a few blocks to the beach - an easy walk. It has an amazing view of the mountains which are lovely at night with the lights. Being this high up, you can even see part of the ocean and Diamond Head. It is an older condo building, but well cared for and had everything we needed, and the price was very reasonable. The Captain Cook staff was amazing and helpful - we had some unique situations and questions - they answered every question! Check-in was easy and smooth. We enjoyed our stay, love the building location. Beautiful views from the condo. Great Location, Convenient and Nice! The rental property was very accommodating. It has every thing you need to enjoy your time in Waikiki. 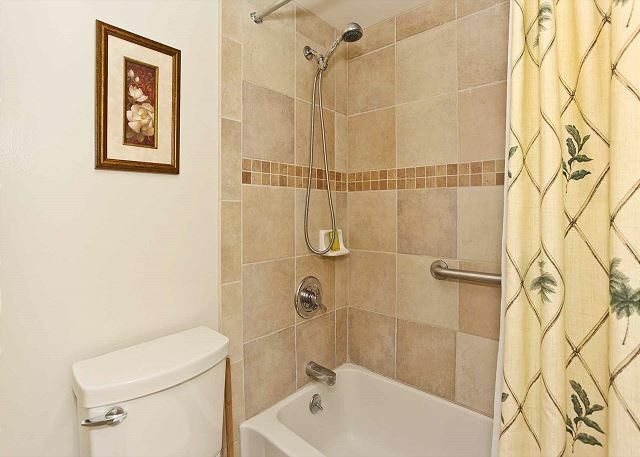 It is a short two block walk to the beach and conveniently located close to restaurants and shopping. Great place overall. Mahalo for your time and input of your recent stay. 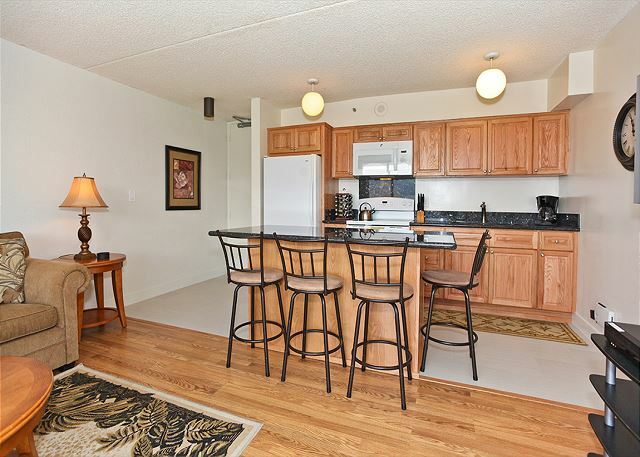 We are delighted your stay was enjoyable and that you appreciated the convenient location of this great condo! We look forward to welcoming you back in the near future. This is our first time booking a condo in Waikiki and I wish we would have done it for our past trips! Will def book through Captain Cook again! Mahalo, for the lovely review and for choosing to stay with Captain Cook Resorts during your recent visit to Hawaii. We're so glad you enjoyed your stay and pleased that you appreciated the location of this great condo! It makes our day to read such an enthusiastic review. I will pass your feedback on to your property manager and our team. We are glad you found us and we look forward to welcoming you back on your next trip! I only stayed here for one night, but the property was clean and well-maintained. Very nice view and in a convenient location. We spent two very enjoyable and restful weeks in this exceptionally clean condo with a remarkable view. The furnishings in the living room and bedroom were high quality and very comfortable. The kitchen and bathroom were outstanding. The unit is very quiet and, for light sleepers like me, the blackout curtains were a real bonus. The kitchen has the basic utensils but, oddly,, only one dish towel is provided;. More is necessary. The air conditioning unit is quiet and efficient, and on days with tradewinds we shut it down and let the natural air waft through the condo. Great bus transportation everywhere is available within a 2-3 minute walk. However, if you have a rental car, make sure someone will meet you on arrival with a parking permit. Otherwise, it costs $20 per day to park in the building. It took 3 requests over 7 days before we got our parking pass. Mahalo for choosing to stay with Captain Cook Resorts and posting the review and recommendation! We will pass your feedback onto your property manager. We're glad your visit was enjoyable and look forward to seeing you again. Excellent property rental. Clean and well maintained. Beautiful view at night. Mahalo, Dawna, for the wonderful 5 star review and recommendation! Hope you are able to plan a return trip soon! Nice place, has everything you need! I would add more dish towels, a dust pan and more cutleries. Mahalo, Bahram! We appreciate the feedback and will look forward to your next visit! The condo was perfect - just a 2 minute walk to Waikiki Beach. The view from the balcony was beautiful. The condo was in great condition and the bed was very comfortable. The only downside was I called twice about a small issue and each time I was told someone would come by today to look at it and no one ever did. But, it was small so it didn't effect my stay. I would definitely stay here again and rent from Captain Cook! Mahalo, Karen, for posting a review of your recent stay. Although we're happy to hear it didn't affect your stay, we sincerely apologize that your calls for service were not followed through. Hope you can enjoy a return trip to our beautiful islands soon! Booked this place last minute and it was just as great as the pictures make it look. Mahalo for the great review, Matt! Excellent communication with captain Cook. The Condo was updated and very clean. Our only issue would have been that the pool was closed for the week and we were not advised, but not a big deal for us as we go to the beach anyway. We will use Captain Cook in the future. Mahalo, Grant, for the great review! We do apologize about the pool closure - we notify guests as soon as we are told - but sometimes the communication is last minute! Hope you're able to plan a return visit soon! We had never stayed in a vacation rental previous to this one. This is such a fabulous property! It had everything we would have received in a hotel and so much more! The location was great and the view was awesome! We didn't close the curtains the whole ten days we were there! Can't wait ti stay at this property again! It was exactly how it was advertised! We're so happy to hear you enjoyed your stay, Darlene! More and more people are learning what a great advantage it is renting a vacation rental over a hotel! Still grinning from your comment about not closing the curtains for the whole ten days! Love it! Mahalo and we hope you're able to return for another visit soon! Excellent location - 1 block from Waikiki beach and close to so many amenties - restaurants, shopping transportation. We we greeted by out Captain Cook rental representative and escorted to our condo and shown our apartment and explained all that we needed to know about our stay. Everything worked out as well as we could have wished for. The on-line site described the facility to a tee! Thank you Captain Cook Rentals!! Mahalo for the great feedback, David! It is reassuring to know that our effort at making our guest's stay welcome and comfortable is being accomplished! We hope you can visit us again soon! The unit was nice and the view spectacular. Basic needs were met for sure. We had an issue with the sofa bed, it was very old and run down. I called Byron and he had it replaced with a new mattress the very next day, which I appreciated. The bed in the bedroom needs to be changed as well. Overall good. Mahalo, Danesse, for the review! We value your comments and are happy to hear the sofa bed mattress was replaced during your visit. Bed comfort is so subjective - the bedroom mattress is just 5 years old and we haven't had any other complaints. Had all the comforts of home, walking distance to everything, 1 block to the beach,have stayed at this rental for the past 3-4 years and would definitely recommend it,its been always a pleasure to deal with Byron and his son James! Mahalo, Bill, for the great review! Great to hear the positive feedback on property managers Byron and his son, James, too! We look forward to your next visit! Priceless view from the Condo! I don’t usually do reviews but it WAS the reviews that made me take this property. On budget? Rent a condo! Save your Hotel miles for other trips. To start, the pictures of the condo don’t do much…yes, Ocean views are nice but the Mountain View is simply breathtaking! We watched the sunrise over Diamond Head daily. The condo had everything we needed…even what we didn’t realize we needed. Wardrobe malfunction? It had a sewing kit! 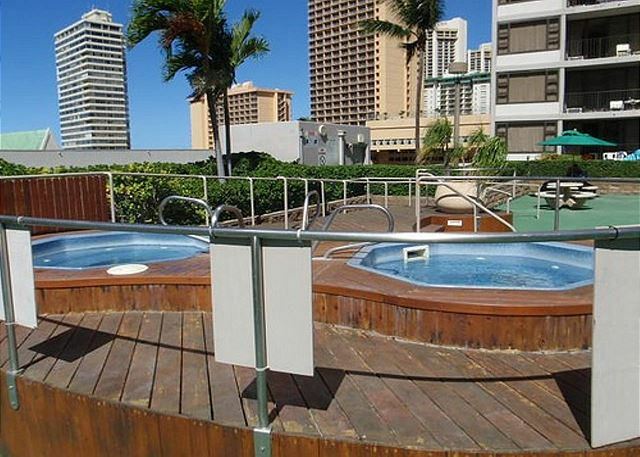 It’s accessible to virtually everywhere in Waikiki and is 2 blocks from the beach. The condo comes with free parking but I decided against renting a car ‘cos buses stop right around the corner. Get a bus map and you are good to go. A quick trip to the store and we had the refrigerator stocked. Byron is truly awesome, multiple kudos to him. We had some trouble with the keyless door, he came immediately and made us keys without disrupting our schedule. We were VERY comfortable throughout our stay. Will I come back? Absolutely. If this condo is unavailable I’d definitely find another using Captain Cook.They are organized and very professional! Very satisfied customer. 5 Stars! Mahalo for the wonderful review and recommendation! So happy to have you stay with us and we will look forward to your next visit! We'll also pass your compliments on to Byron, the property manager! First time using VRBO to rent a place to stay and I was thoroughly impressed and very satisfied with our stay. I was looking for a property that had a full kitchen because we were traveling with my 6mo old, and thought it would be nice to have a large sink to wash bottles etc. The property was a perfect size for our family of 3, and the room had enough space for us to fit a pack n' play. There's a lanai that gives you a stunning mountain view. The property was really clean and well stocked with the basics. Location was perfect; very centralized, quick walk to Waikiki beach and amazing food in the area. Property management was super friendly and helpful as well. Byron was assisting us throughout the stay and was very responsive whenever we called. The garbage disposal was having issues while we were there and he had someone come fix it within a day. We also asked for a pack n' play when we got there and he had it dropped off within hours. I couldn't have asked for a better place to stay, and would love to come back on my next trip to O'ahu! If i had to nitpick, I would say the bathroom can use a tad upgrading and cleaning. But other than that, I am so glad we booked this place! Mahalo, Louisa, for sharing comments about your recent stay - your FIRST VRBO experience! We're so glad it was such a good one and if you're able to return for another visit, please give us a call! Great location.Parking space was a plus.Had 3 issues/complaint:1) Our TV didn't work. Got it fixed 3 days after reporting.2)Divider between living space and bedroom not properly installed. Property manager could not fix it. Worried it would fall on someone.3) Garbage disposal not working. Got it fixed when new tv was delivered/installed. Aloha Maria, and thank you for posting a review of your stay. We apologize for the delay in replacing the living room TV. The first replacement was not functioning, but fortunately, a new 48" Smart flat screen was installed the next day (which supplemented the 2nd TV in the bedroom). The divider was installed correctly, but needed an adjustment the property manager was unable to make. Our repairman made the correct just a couple of hours after it was reported. We appreciate your patience through the repairs and hope you'll be able to return for another visit soon! This condo was absolutely perfect and fit my needs 100%. It was for myself and my two granddaughters. The description online was accurate and the pictures were horrible surprises. There were even some pleasant surprises such as new large flat screen television and DVD player in living room for all those Disney movies we watched in the evening and a boogie board and shade tent for the beach. The process for renting online, checking in and checking out were fast, simple and efficient, thanks to Byron who provided great service and was available to answer any questions I had, as this was my first time ever renting a condo. I've been to Honolulu several times but always stayed in hotels. Never again...this will be my new "go to" accommodations going forward. Thank you for a wonderful experience! What a wonderful review, Ramona - mahalo! We're happy and honored to be your new "go to" accommodations for your next visits! Excellent location, great Condo, had everything plus more. Captain Cook Resorts were wonderful to deal with. Amazing mountain views, with sparkling night lights. Highly recommended. Good facilities. We would go back to this apartment in a heart beat. I was concerned it wasn't close enough to the action, it was so close it took 5 mins walk to get into the heart of it all, or one minute walk to the Trolley ride which was so very convenient. Everything was exactly as the pics and description provided. Another Great Stay with Captain Cook! This trip was my second time using the Captain Cook private vacation rental. This time, I also recommended the company to my father. My last stay was so good that I had him cancel his reservations at a hotel in the Waikiki area so that he could go through Captain Cook. My entire family LOVED the Waikiki Banyan! The room was phenomenal with a breathtaking view of the mountains and my school, Chaminade University. Although we had a slight issue with our electronic door lock malfunctioning, our property manager handled it in a timely and professional manner. I would like to thank Captain Cook for making my college graduation trip a dream vacation for my family. We will definitely be using you guys for all of our stays in beautiful Hawaii. Mahalo!! Mahalo, Alexia, for the positive comments and recommendation! We work hard to offer great accommodations and service, and we're so glad your college graduation trip turned into a dream vacation for your family! We look forward to seeing you on your next visit! Excellent facility, comfortable room with all necessary amenities, can't beat the location. Great time! From my introduction to Byron...the agent ..until I left the was fantastic. Lovely apartment..well kept and stocked....everything one could wish for, the agents....Captain Cook ...were outstanding. Byron could not have been more friendly or helpful...10 out of 10. Many thanks from a delighted customer. Thank you so much for the wonderful comments! We'll be sure to share your comments with Byron (Property Manager). We're delighted YOU are delighted and look forward to your return visit! My second step to Hawaii was 33 years from first step in 1981 and I had no idea of the stay at mountain view side of the condo instead of popular ocean view side room. However, the room offered us was immediately attracted us by equipped with well and quiet furnished in addition to marvelous landscape view of mountain with wide spread houses along the ridge as well as in the valley. We did enjoy our 2 weeks stay through favorable environment by best use of good location and by the results, I could recharge my battery during the stay. Hopefully we are able to return again shortly and I appreciate your comprehensive arrangement and thanking you in advance for your similar service in the near future. I really enjoyed my stay here. The unit was clean and very conveniently located. The city views, both at night and at sunrise were nothing short of spectacular. I would definitely stay here again! And the people with Captain Cook were most helpful and professional. Very nice stay! Everything was perfect, since beginning, when Byron received us at the Lobby and explained the terms and rules of the building. I was with my wife and my 3 years old daughter, so the kitchen was very useful to prepare some meals to my child. The apartment looks exactly like the picture, no surprises. Great location, great view from 36th floor, free wifi and parking lot. Being on Waikiki put us close to the action and beach. Being up 36 floors kept us away from the noise. Beautiful view of the mountains and golf course. Byron was super. The ony real issue we had was the antenna on the rental car scraped the cieling of teh parking garage. A totally carefree week! 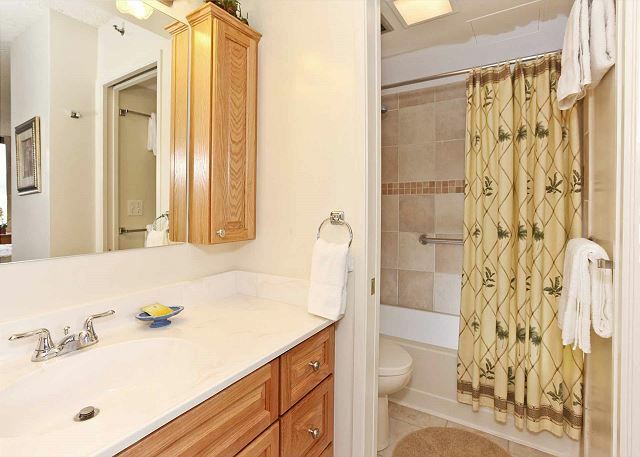 Nice clean unit, close to Waikiki. Unfortunate that the construction is still going on which led us to a couple of earlier than expected wake up times but overall a nice place. My parents and I stayed at Waikiki Banyan #3605 T-2 from December 24, 2012 to January 1st, 2013. The room was spacious enough to accommodate the three of us. My parents used the master bedroom, while I slept on the sofa bed in the living room. The room was kept very clean and we enjoyed the mountain view from our lanai. Location was great. It was 1 block away from the beach, located behind Marriott. The trolley bus stop was very near so we found no difficulty moving around in Waikiki. The greatest part was that we were able to view the fireworks behind the tail of Diamond Head from our own lanai on New Year`s Eve !! Of course, we did go down to the beach for the Countdown as well !! The fireworks were beautiful and I was amazed to see so many people there. I would definitely love to stay at Waikiki Banyan again. Thank you very much for a wonderful stay !! We spent a week at this condominium. It was all as expected. Clean and in good condition. There were enough number of towels and others. Very well equipped. After just one night at the Marriott Waikiki, we decided to look for something that represented a much better value for the dollar. Waikiki Banyan, situated just one block away, was not only cheaper by around 25%, but much better in virtually every way: one bdrm apartment, two TVs, full kitchen, full-size fridge (this was critical for us), playground, parking and Internet included etc. Captain Cook Real Estate was very prompt in answering our rental inquiry on a Saturday morning (8 AM) - we wanted to avoid paying any extra nights at the hotel. By lunchtime, we found a property we liked, viewed it, signed the contract and received the keys. Denise (Reservations) was very helpful and reliable - while Byron (Property Management) was by far the most accommodating, genuine and friendly professional we have had a chance to meet in an awfully long time. He really took an interest in ensuring that we had everything we needed for an awesome vacation. Have absolutely no hesitation in highly recommending their services; when we go back, we know who to call. WE REALLY ENJOYED OUR STAY AND HAVE BOOKED THE WAIKIKI SUNSET FOR THE SAME TIME PERIOD NEXT YEAR THROUGH CAPTAIN COOK. SEE YOU IN 333 DAYS. Condo is basic, no frills, and under 600 sq. ft. For a stay over a month, it is a little small. It has a wonderful view especially at night. Clean flooring,great TV and nice new fridge. Nice to have the beach chairs and umbrella. Thank you. Clean & comfortable suite, with a beautiful view. Great location, all the comforts of home. Looking forward to another visit. 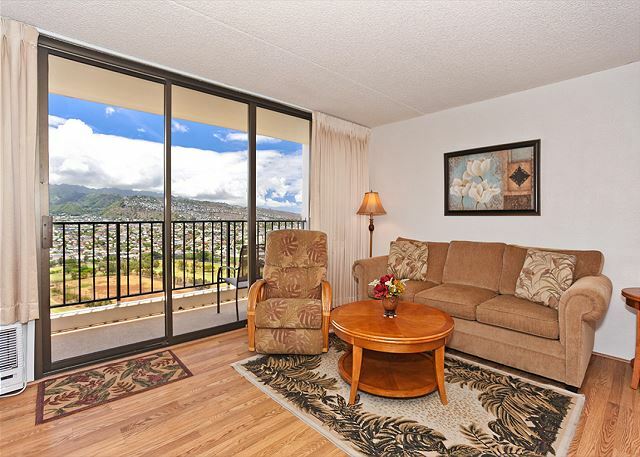 suite located walking distance to the beach in waikiki. nice suite, nothing fancy just perfect. would recommend to anyone!